A play for boys, and it’s not about sports? Imagine that! Nationally recognized Dallas Children’s Theatre takes on a wide range of topics and challenges every year in its programming. 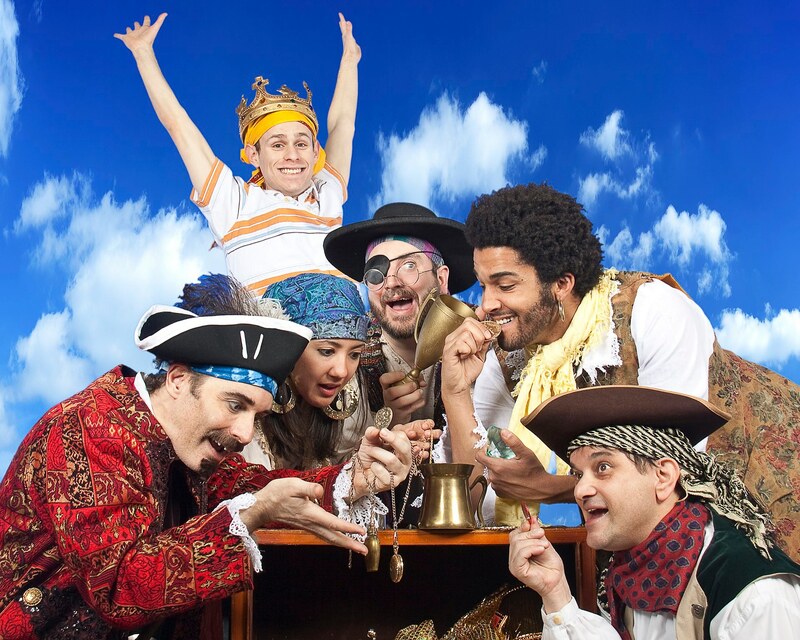 Right now it’s running a swash-buckling, high energy, funny-bone tickling musical adaptation of Melinda Long’s best selling book How I Became A Pirate, in a southwestern premier engagement. It could fire the imagination of many a young boy to stumble upon a hapless band of pirates mistakenly landing on a beach near his home, eager to adopt him into their tribe of misfits and to find a safe hideaway for their hoard of buried treasure. How I Became A Pirate was named winner of the Irma S. and James H. Black Award for Excellence in Children’s Literature, Book of the Year, in 2004, followed in 2007 by its World Premier Stage Production at the Emerald City Theater in Chicago (book and lyrics by Alyn Cardarelli and Music by Grammy award winner Steve Goers). Young Jeremy Jacob, played with a sweet, energetic appeal by Dallas newcomer Scott Zenreich, discovers life on the “high seas” has great freedom. But it has its challenges, too. He has to learn how to “Talk Like A Pirate” to forget his good manners, avoid a menacingly grinning shark (huge cheers from the audience every time the creature poked its snout from the water) and survive a loud storm that tears up part of the pirate ship. He begins to miss his family at home and can’t fall asleep easily when he learns that “Pirates Never Tuck You In”. In the end, Jeremy makes a wise decision but helps out his newfound friends, as well. Mum’s the word—ye’ll have to go spy what ‘appens for yerself…. The cast included: Zenreich as hero Jeremy, with pirates Chad Patrick Smith, Karl Schaeffer and Alexandra Valle singing and sparring with equal zest. Paul Taylor imbued Captain Braid Beard with warm élan and stole the show as the pirate captain with a loving heart and a twinkle in his eye. He made a fine role model for lads of all ages. A fantastic pirate ship set, pre and post storm, designed by Randel Wright, engulfed the entire DCT stage, the sort of ship a bevy of young boys would have a wild heyday exploring. The light and sound effects (Linda Blasé and Marco Salinas) made the storm wrecking the pirate ship snap and crackle with vitality and enough scary reality to find Jeremy’s second thoughts about becoming a pirate believable. Nancy Schaeffer directed and choreographed the show with musical direction by B. Wolf. Shiver me timbers! Don’t miss this boat, with whatever youngsters age 4 and over you can tow along. How I Became A Pirate runs through February 21 at Dallas Children’s Theatre, 5938 Skillman St., at Dallas’ Rosewood Center for Family Arts. Thank you, Alexandra! The best thing about doing this wonderful childrens’ piece is the autographs after the show. I love the kids and their reactions to me when they see me up close. Some are frightened at first (probably the heavy black eyeliner reminiscent of Captain Jack Sparrow and the blacked out teeth) but when they smile shyly (or not) and ask for an autograph or picture, I melt. I love DCT!